The Dunkerque Seaways arrived in the Port of Dover about 20 mins before her scheduled departure time of 0800 but was soon alongside ED6 discharging what appeared to be a full load of freight. Loading commenced almost immediately with us being directed to the upper car deck. As VIP customers we had priority loading and were parked right at the front of the ship for immediate disembarkation in Dunkerque. Upon entering the passenger accommodation we headed straight for the Executive/Business lounge to settle in for our crossing. Walking around the ship it was apparent that it was quiet a busy sailing, with at least one coach of school children heading for the continent. Even though the vessel arrived late she only departed about 10 mins late. Having watched the departure from Dover we were soon heading for a full English breakfast in the cafeteria. I have to say the service here was not up to it’s usual standard due to an apparent shortage of staff. There were two people serving food and only one on the till, as a consequence queues built up quite quickly and instead of opening another till to get the queues down the rather condescending gentleman serving the food decided to not serve people and just walked off until the queue at the till had gone down, consequently the queue of people waiting to be served grew, all in all it didn’t help the situation. The cost of the was comparable to the P&O breakfast but in my opinion not as good. The rest of the journey was spent in the Executive lounge making good use of the complimentary Tea and Coffee. 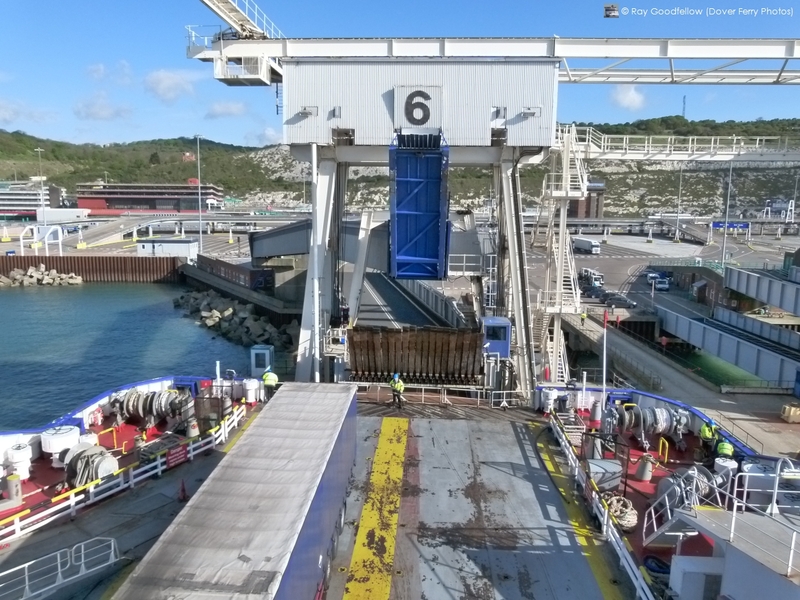 The journey was completed within 2 hours but as usual with DFDS Seaways to Dunkerque there was a slight delay upon arrival for car passengers as freight has to be cleared from the upper trailer deck before cars can disembark over the bow. After a short delay we were soon off the vessel and leaving the port. It is worth noting that the new road from the port is now open making access to the A16 a lot quicker. 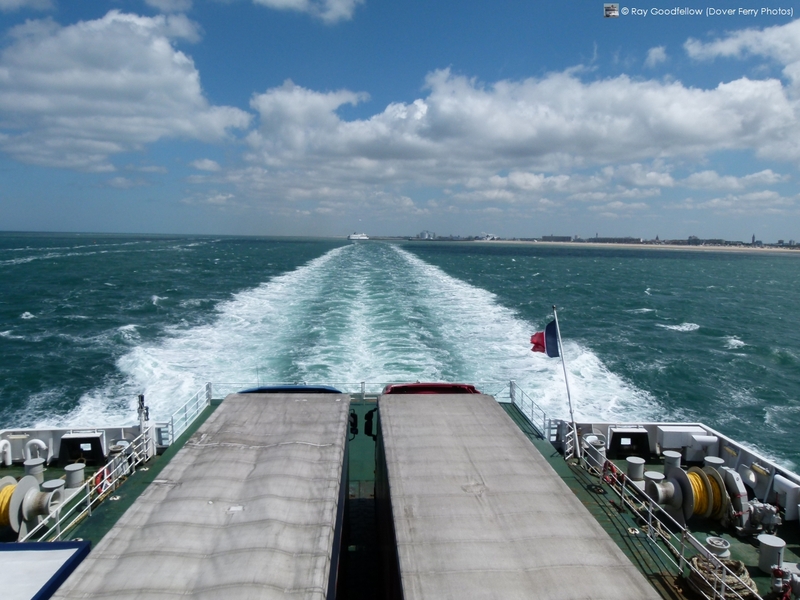 We were soon heading in the direction of Calais and a return to Dover on the Deal Seaways. 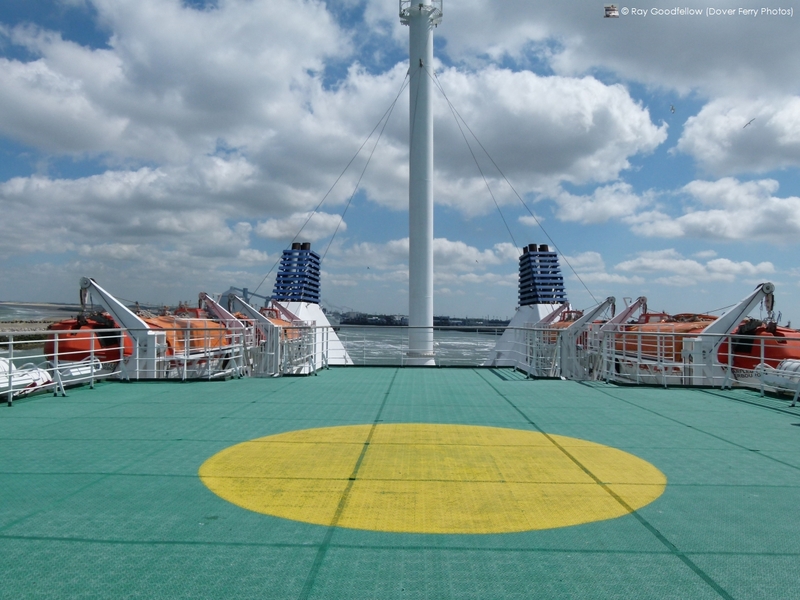 Overall the Dunkerque Seaways was in good order and the crossing was pleasant. However when it comes to customer service the phrase “could do better” springs to mind. 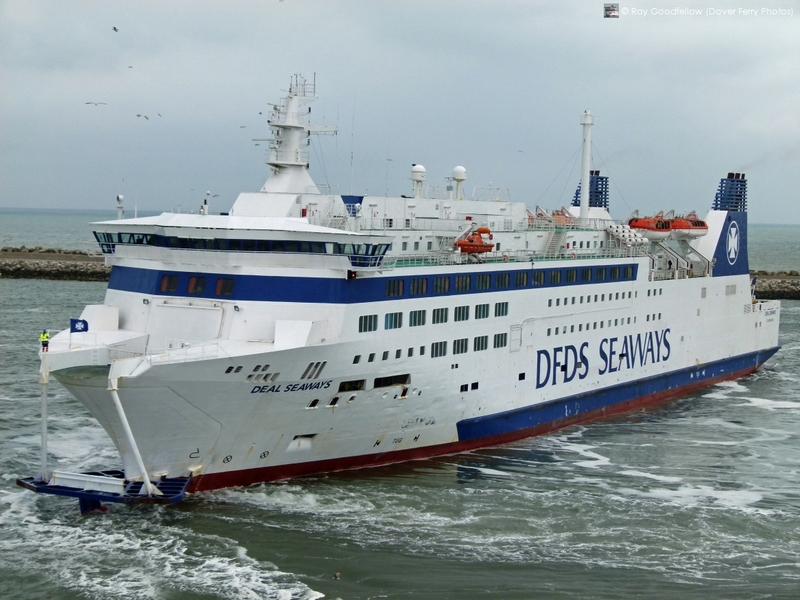 With the jubilee and the Olympics just round the corner traffic levels are going to increase significantly and as a consequence the on-board teams are going to have to up there game and deliver the service that I have previously experienced with DFDS Seaways at Dover. As the introduction surrounding the entry into service of the Deal Seaways has been well covered on our forum so I shall dispense with the history and background information. Having made it to Calais in plenty of time we were soon going through the usual check in and immigration formalities. All to soon we were waiting in the lanes at berth 6 just as the Deal Seaways approached the berth with tug assistance (the winds were up to 30 knots). It would appear that may have been a problem on the way out as the Police Aux Frontier (PAF) and an Ambulance were waiting for the vessel to dock. As soon as the ramps went in they boarded the vessel. 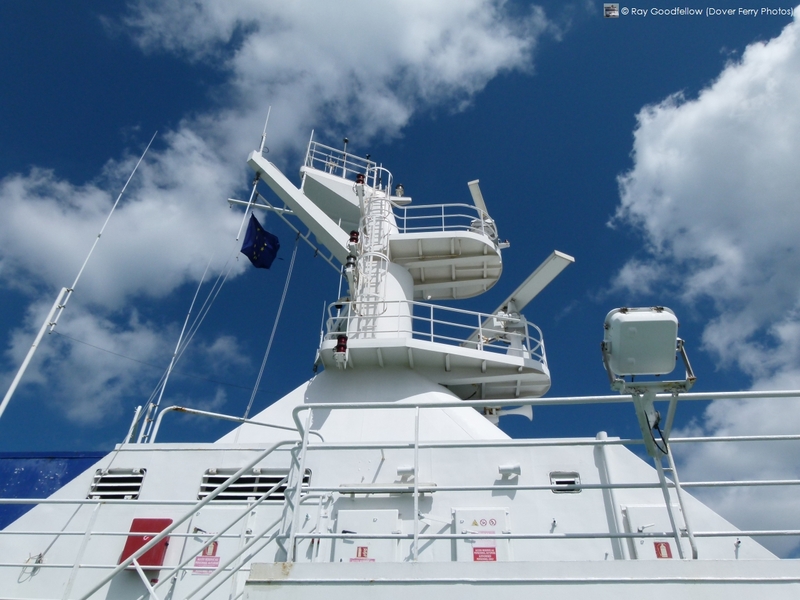 Disembarkation from the vessel was quick and all to soon we were driving on board via her upper car deck (deck 6). There was a moderate load for this return crossing, not really surprising for lunch time on a Monday. 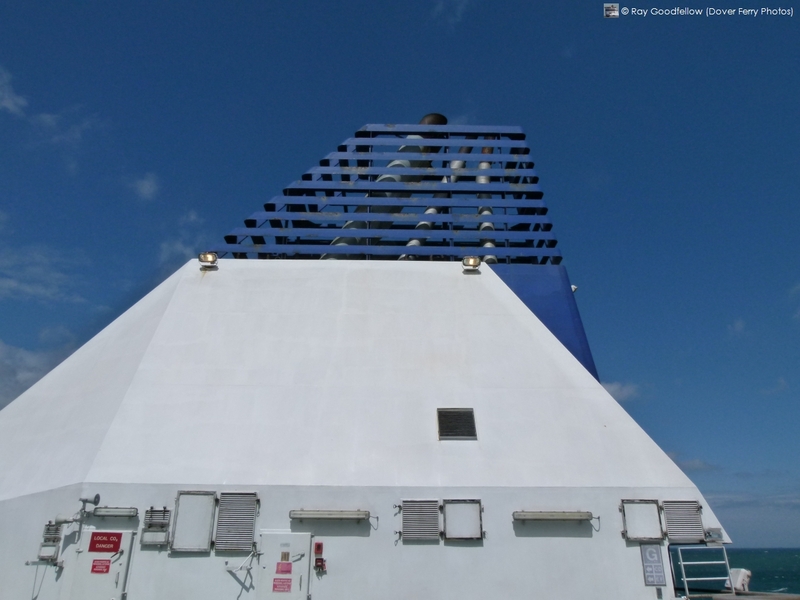 The first thing that is apparent upon boarding is how narrow her upper vehicle deck is due to the reclining seat lounges and cabins which are found to Port and Starboard on this deck. The ship’s bell behind the starboard bridge wing showing her original name of Barfleur. After spending a good 20 mins outside making good use of the ample deck space we soon headed inside to see what was on offer. The best way of describing the Deal Seaways is compact and bijou. She seems like a blast from the past in the way everything seems to be shoe horned into the small accommodation. Now I don’t mean that in a bad way but it reminds me of vessels past such as the Stena Cambria or more recently the Seafrance Renoir. The vessel seemed relatively clean throughout the public spaces but the toilets were reported to be quiet unclean and smelly. After entering the rear of Deck 7 through Les Alizes bar (which was closed) we made our way forward through the Arc en ciel cafe which was open and had a good selection of pastries and drinks available. I am afraid this is the only internal photograph taken by myself as there were to many people about. This is the Les Alizes Bar. Moving forwards Le Kiosque was closed but I was surprised to find the main shop open, it wasn’t the biggest shop in the world but it had a similar selection to that found in the shops on the D’s to Dunkerque. Moving forward again you arrive at the `Turquoise’ self service restaurant. The restaurant covers the full width of the vessel at the bow but unusually only has three windows overlooking the bow. The restaurant was open and the food on offer looked good and was very reasonably priced. We decided just to have a plate of chips as we had only eaten breakfast a couple of hours earlier. The weather on the way home was a bit blowy which resulted in the vessel moving around a bit but it wasn’t uncomfortable. All to soon we were approaching the port of Dover after a pleasant 90 min crossing. We had to wait off the port for a few minutes to allow the Spirit of Britain to pass through the entrance. After the `Spirit’ had departed we entered the port and commenced our manoeuvres for berth 5. 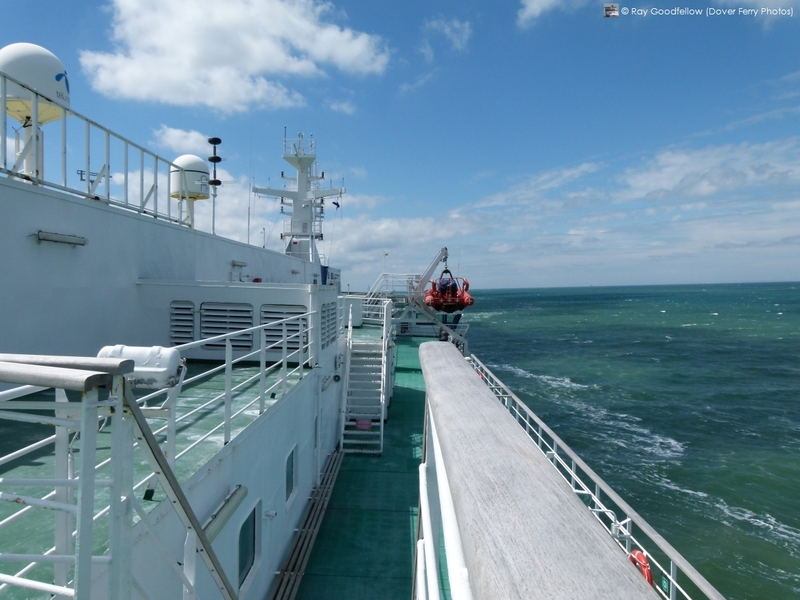 We were soon alongside and disembarking the Deal Seaways. Overall I would class the Deal Seaways as a nice vessel but I wouldn’t class her as a suitable vessel for short sea operation. I have been reliably informed that due to her extraordinary main deck headroom she cannot take both main deck and topdeck ramps simultaneously on any of the Dover berths. She has to load one deck and then the other. The berths do have vertical hydraulic rams between the ramps to enable compensation but Deal Seaways is just outside of the ramp adjustment parameters. Additionally we travelled on her with a light load and she seemed well filled, I think on a busy crossing she may feel a little claustrophobic. Additionally I think people’s expectations in regards to ferries are higher than she can deliver in terms of the wow factor and facilities. Now I know there are those of you that are passionate about this vessel and what I am saying is nothing against the ship herself, she is a nice little ship and would be perfectly suited to the longer crossing but saying that if I had to choose between the Deal Seaways and Norman Spirit I would choose the Deal Seaways due to the number of facilities that are available.